The rules were simple. 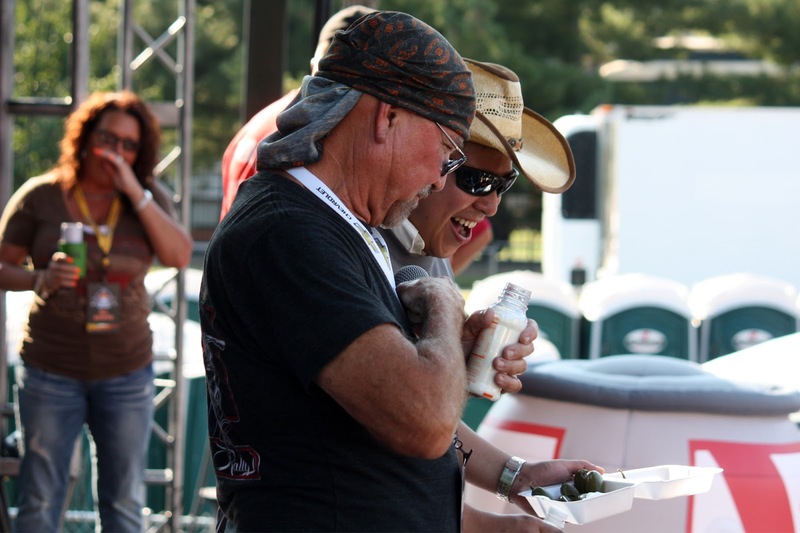 Each team member got ten whole pickled jalapenos on a plate and had 60 seconds to eat as many as possible. At the end of the minute, the total eaten by each team was tabulated and the team with the most won. 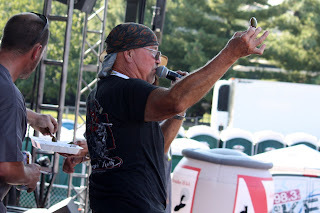 During the tabulation period, one of the members of "Team Joe" challenged the emcee, Joe Giles, to eat one of the leftover peppers. 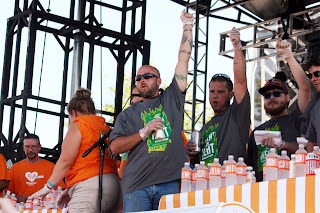 In the spirit of charitable giving, Joe offered to do just that if a member of the crowd would donate $20 to the tip jar of the JDRF (Junior Diabetes Research Foundation) crew selling beer in the garden that day. 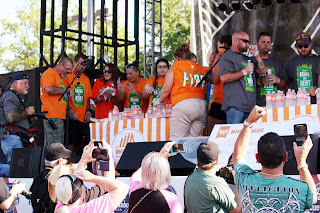 Before he could start working on his jalapeno, not only had that donation been made, but it was joined by 8 others for a total of $180 to a very deserving non-profit. greatly to profits of the Pepto Bismol company for the rest of the day). Joe recently commented, "It took about a week and a half to recover fully. Apparently, I'm a lot older than I used to be." Many thanks to Whataburger for helping us support local charities! If you weren’t there for the 4th Annual BBB Car Show, you don’t know what you missed. We had it all, customs, street rods, vintage treasures, rat rods, even custom bicycles for the kids! All that and vendors, a DJ, special awards, everything that goes with a great car show. This was a GREAT car show, at a motorcycle rally! 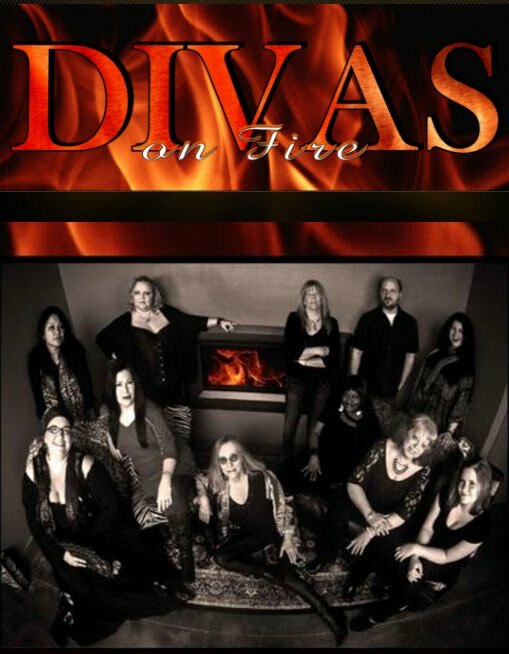 Held at the Arvest Ball Park venue in Springdale, the Bikes, Blues, and BBQ car show is rapidly becoming one of the premier shows of the mid-west with a stunningly diverse group of fabulous entrants every year. Don’t miss the 2016 version; it’s just going to get better. On Friday night of the rally, you can sample BBQ from some of the best BBQ cooks of the Kansas City BBQ Society. 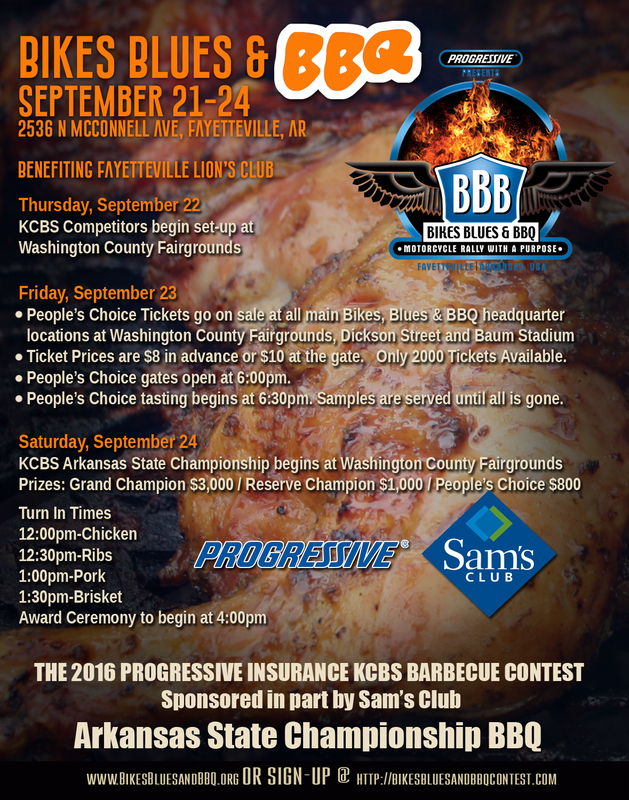 These are the guys who will be vying for the Arkansas KCBS State Championship on Saturday, but they are cooking just for you on Friday night. Tasting kits are $8.00 in advance and $10.00 at the gate. 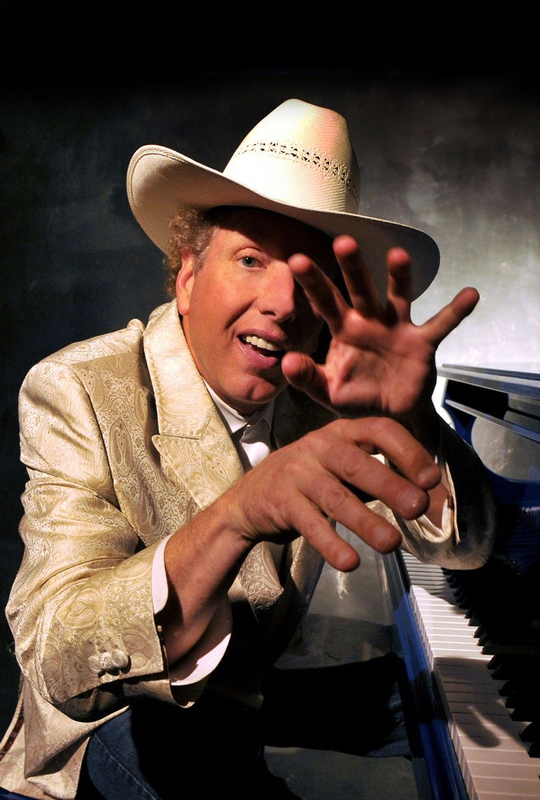 Advance tickets are available at the Fayetteville Visitors Bureau – 479-521-5776. 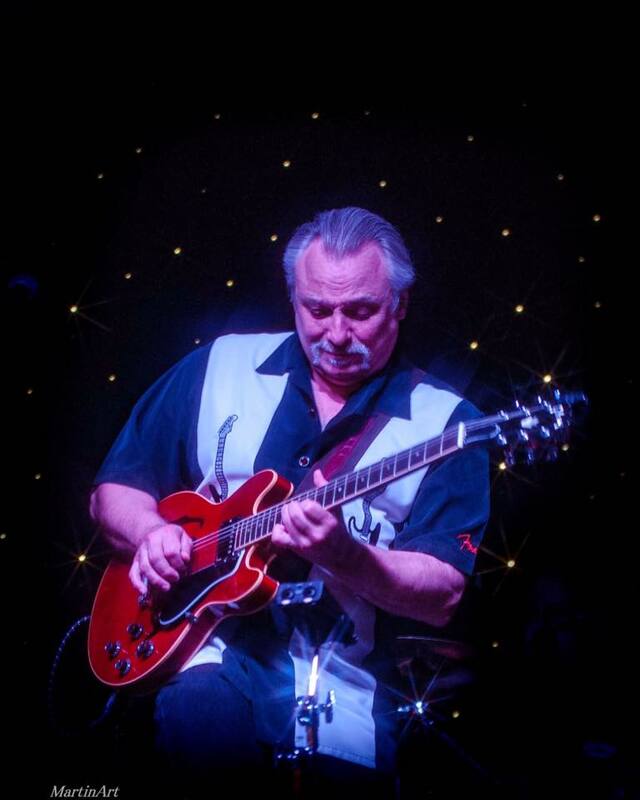 Ticket sales benefit the Fayetteville Lion’s Club. Oh, man! The Bikes, Blues, and BBQ Vintage Bike Show presented by the Ozark Vintage Motorcycle Association is simply too good to believe. Over 150 magnificent vintage machines, many of which most of us have only read about. 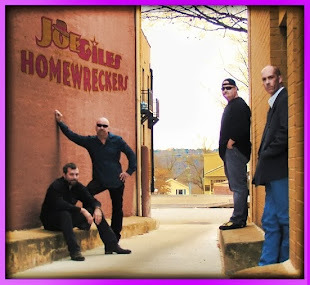 Held at the Arvest Ball Park venue in Springdale, this is the third year for the show and the first two years drew both killer vintage iron and great reviews. Aside from pristine examples of early bikes from companies that are still with us, the Harleys, Triumphs, Indians, Hondas, Yamahas, etc., there will be a few machines that you’ve only heard of, and never seen. Or perhaps never even heard of. Ever seen a Vincent? We had one here that looked like it just rolled off the production line. How about a Ward’s Riverside 125? We had one. And that’s just the beginning. A true motorcycle lover can spend hours at the show marveling at these machines of yore. 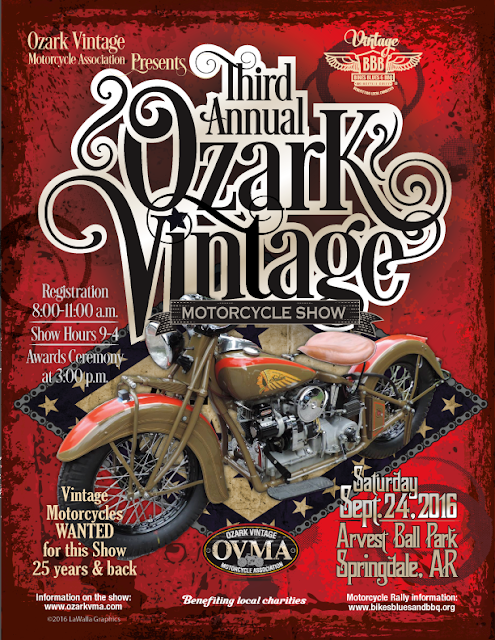 The Ozark Vintage Motorcycle Assn. puts on this show each year and does a fabulous job. 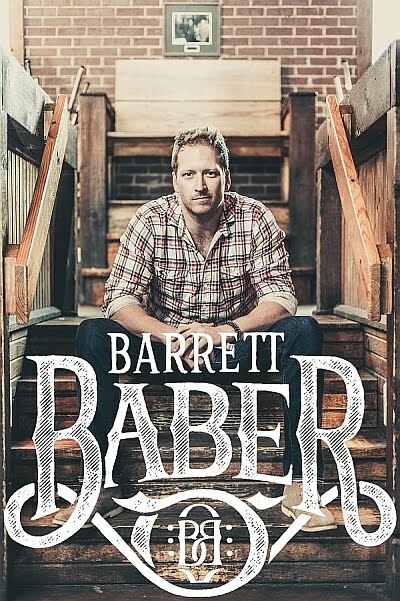 This year, the show will be held on Saturday, Sept. 24, from approximately 8:00-2:00 at the Monster Experience Venue at the Arvest Ball Park in Springdale. 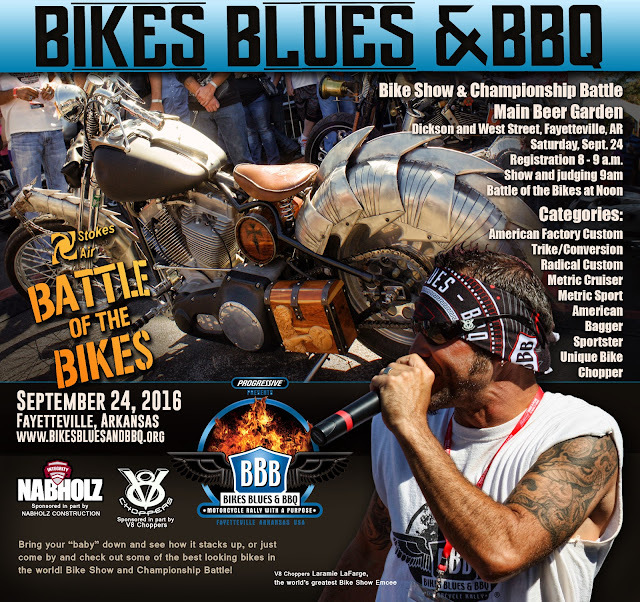 Don’t miss this; it’s truly one of the coolest things at Bikes Blues and BBQ. One of the most popular events at Bikes, Blues, and BBQ is the Firefighters’ Poker Run. 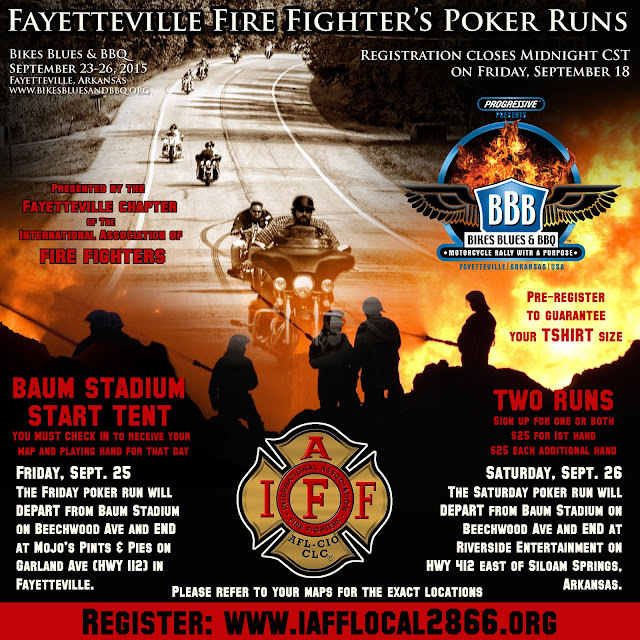 And just like Bikes, Blues and BBQ is the “Rally with a Purpose”, these poker runs have a purpose as well. These runs help to support Camp Sunshine, a summer camp exclusively for children who are burn victims, often severely burned to the point of disfigurement. Camp Sunshine is a place where these kids can just have a good time, with no one staring, no one asking questions. They get to be just kids having a good time. To visit Camp Sunshine is to leave with a lump in one’s throat, and teary eyed. Guaranteed. The poker runs are fun, the routes are beautiful, the sponsor stops are friendly and appreciative, but most importantly, this is chance to make a real difference in some great kids lives. You’ll have a guided ride through the Ozarks that ends with lunch at a private classic car museum in Bella Vista, AR. 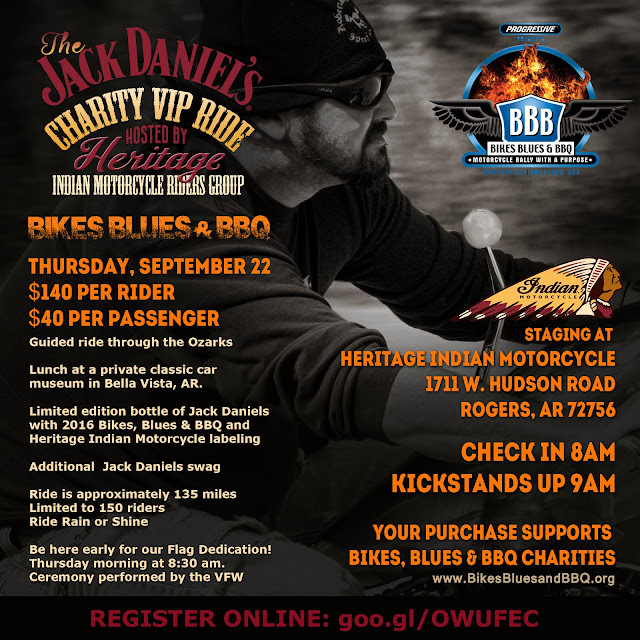 Plus you’ll receive a limited edition bottle of Jack Daniels with 2016 Bikes, Blues & BBQ and Heritage Indian Motorcycle labeling. Ride is approximately 135 miles/3 hours plus a 1/2 hour break. Ride is limited to 150 bikes and we ride Rain or Shine. 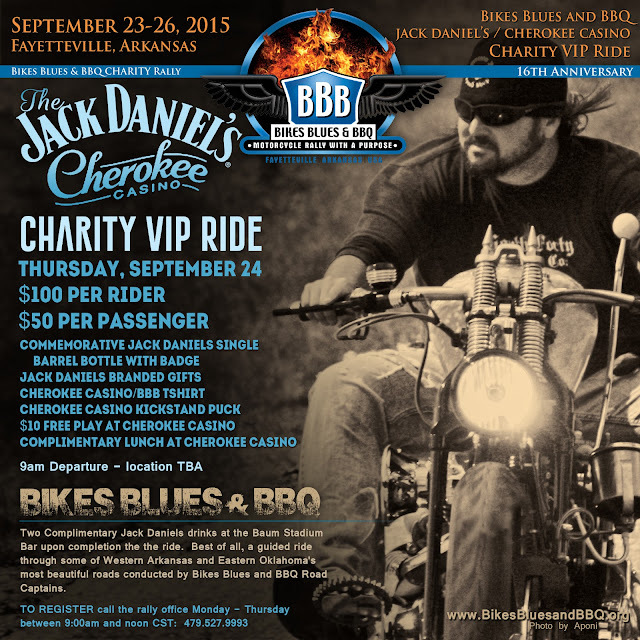 * Your purchase supports Bikes, Blues & BBQ Charities. * Passengers must purchase a Passenger add-on for $40. Includes lunch. This route could easily be cut in half if one were to travel down I-49, however, if you have a day to indulge it's a worthy ride. 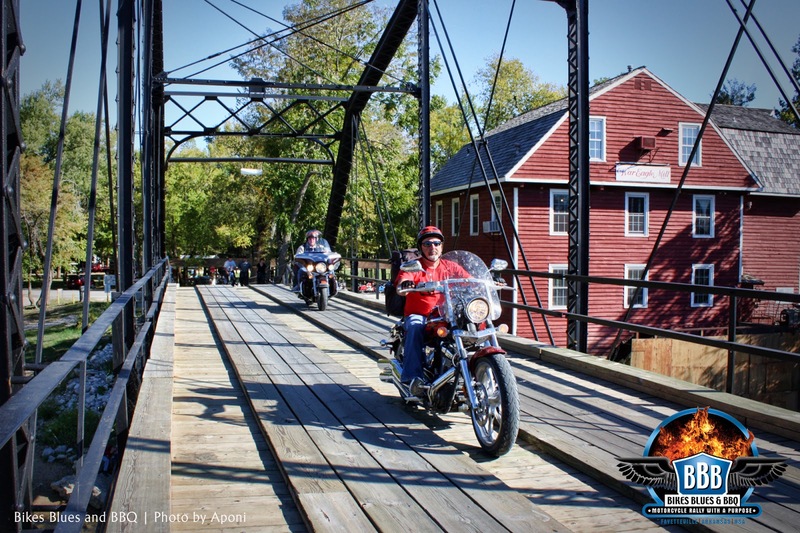 The route could be called "Roaring Bridges" due to the fact that it consists of two awesome bridges, War Eagle Mill and the Little Golden Gate aka Beaver Bridge, as well as two wildlife attractions; Turpentine Creek for wild cats, and Wild Wilderness Drive-thru Safari. There are far too many interesting places to stop on this route to hope to achieve them in one day, but having a wide selection to choose from makes the route one you could travel many times, enjoying different stops each time. You'll start out at Dickson Street and head east on 265 through quaint Arkansas small towns, meandering past ranches and horse farms. Once you take the jog on 412 and get on 303 N, look for the rustic covered bridge on the left side of the road. Continue north to War Eagle Mill, being sure to have a gander at the incredible scenic overlook with a view of the river, meadows, and the mill in the background. Upon arriving you'll enjoy seeing and riding over the historic War Eagle Mill bridge. Be sure to stop at the mill and at the very least take a walk through. (We have a habit of collecting a spackleware dish each time we pass through, and a jar of jalapeno jam). The cafe on the top floor is outstanding, so if you're ready for a meal you won't regret taking it there. Old fashioned southern cooking at its finest. From there you'll continue north, where you'll enjoy the beautiful drive and smooth, velvet highways through Hobbs State Park. Once you leave the state park, you'll head north on HWY 23, also known as the Pig Trail. 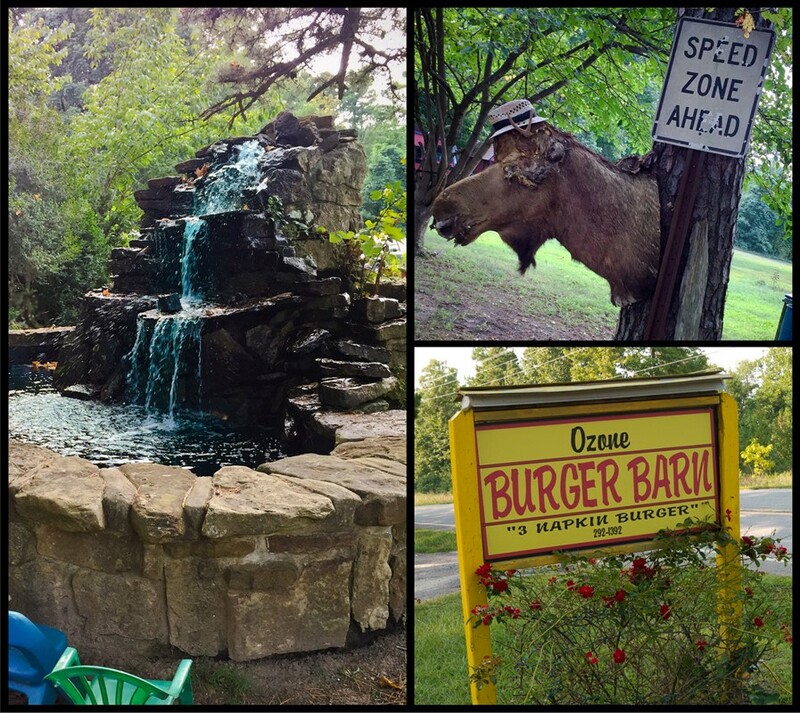 You'll pass by Turpentine Creek Wildlife Refuge along this highway as you make your way north to the beautiful Victorian village of Eureka Springs. Here, you'll find a huge variety of shops, restaurants and diversions. If you plan to hang out, you might visit this website for tips on places to go, things to do and where to eat. After crossing the bridge, you'll head south on HWY 62 through Rogers, where you'll be passing by Pig Trail Harley-Davidson (2409 West Hudson Road, Rogers) and the Rockin' Pig Saloon. You'll continue west on this road, which become HWY 102 after you go under the I-49 overpass, until you reach the small town of Decatur. 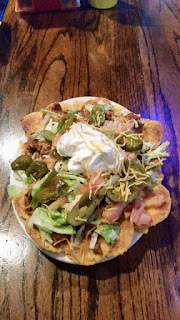 Here, you'll head south on 59 until reaching Siloam Springs, home to the Cherokee Casino, which boasts an outstanding buffet! The final leg of the trip takes you south from Siloam Springs on HWY 16, a beautiful rural drive heading into state forest and Lake Wedington. Upon reaching the lake, you'll find three options to pull over, the recreation area, campground in the middle, and small parking area at the furthest east end. From there it's beautiful twisties and quiet roads all the way back in to Fayetteville. 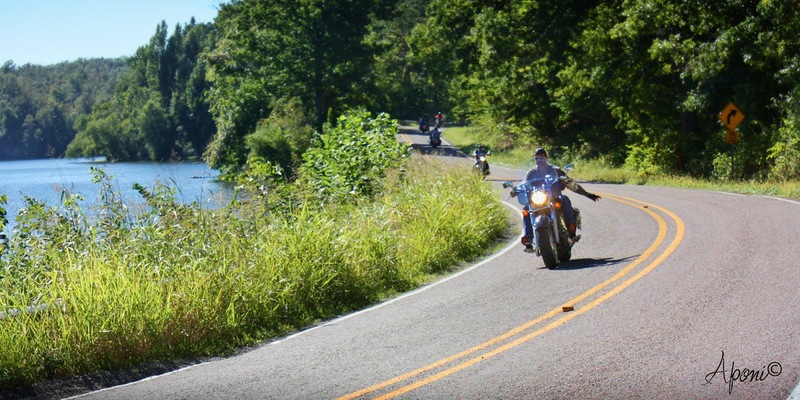 Obviously, we all love when folks show up in Northwest Arkansas for Bikes, Blues, and BBQ, but the Ozarks has a lot to offer as a destination for riders throughout much of the year. And one of the best things about this part of the country is the food. Now when we’re on the road, we stop at the fast food places as much as anyone. BUT, you can’t beat locally owned, unique spots for good food and interesting times. So, let’s talk about my favorite burger joint in the world. On North College Avenue in Fayetteville sits an iconic Fayetteville establishment, Arts Place. It’s a little dark inside, and sometimes it’s a little smoky. Further, depending on the time of day and whether they’ve had a chance to sweep the floor, you may very well walk across a surface replete with peanut hulls. Taking up a large part of floor space are four pretty good pool tables. Got the picture? You won’t find any posh food (or people) there, just honest sandwiches, fries, and cold drinks. And it’s all wonderful food. 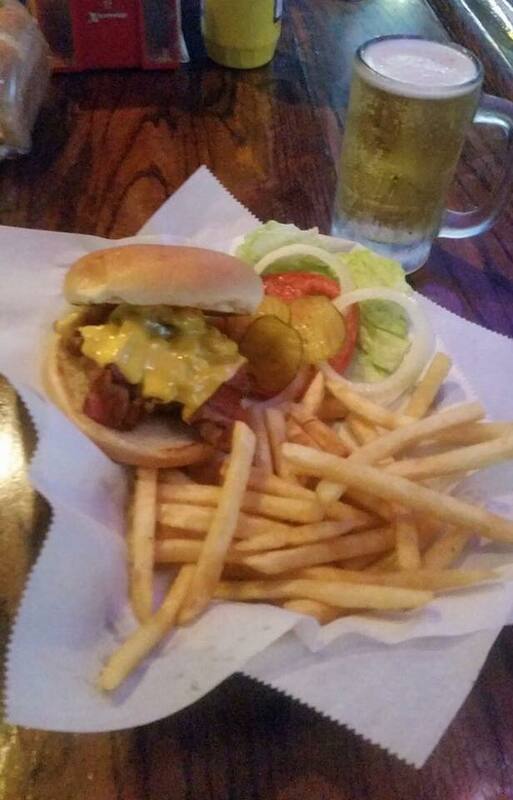 Among the locals, it’s generally accepted that Art’s has some of the best burgers in this part of the country. (I personally think they are the best, hands down, but that’s a matter of personal taste.) 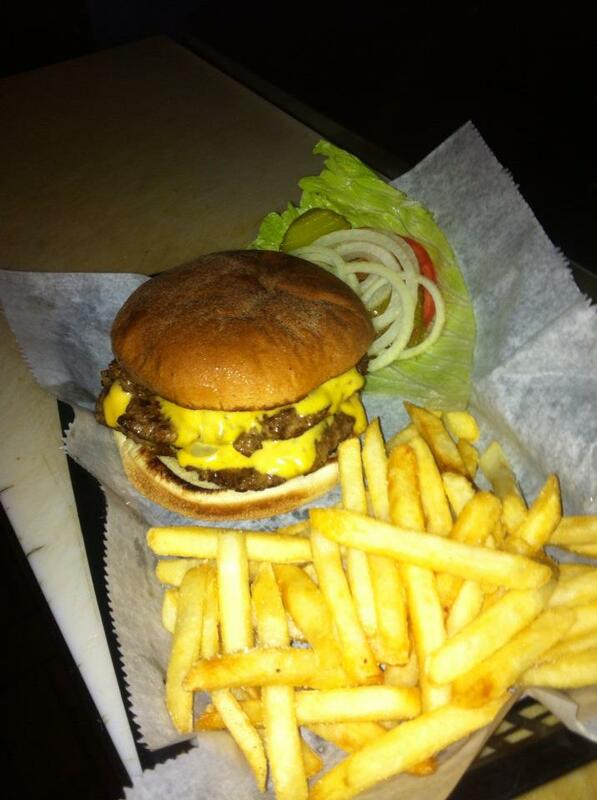 The burgers are large, well-seasoned, and have the perfect “grease quotient”. If you are a burger fan, you know exactly what that means. Everything is reasonably priced. 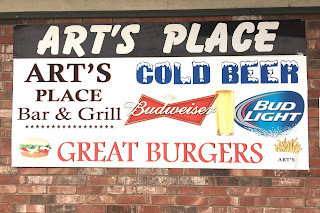 Burger, fires, ice cold long-neck for less than $10. You can’t beat that. 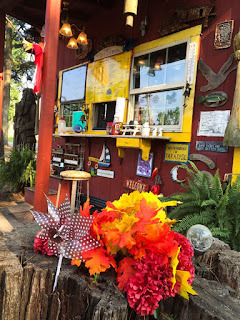 Of course, in a place like this, you will always meet some of the local characters and that makes Art’s even more attractive to us who spend time on the road. 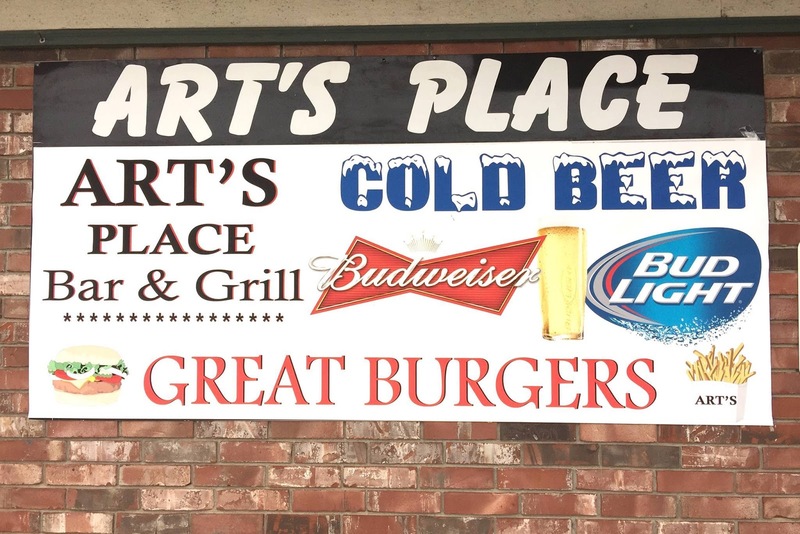 Art’s Place is located at 2530 North College Avenue, Fayetteville for those of you who do the GPS thing. If you come on a nice day, you’ll notice a proliferation of bikes in the parking lot, both in the front and out back. 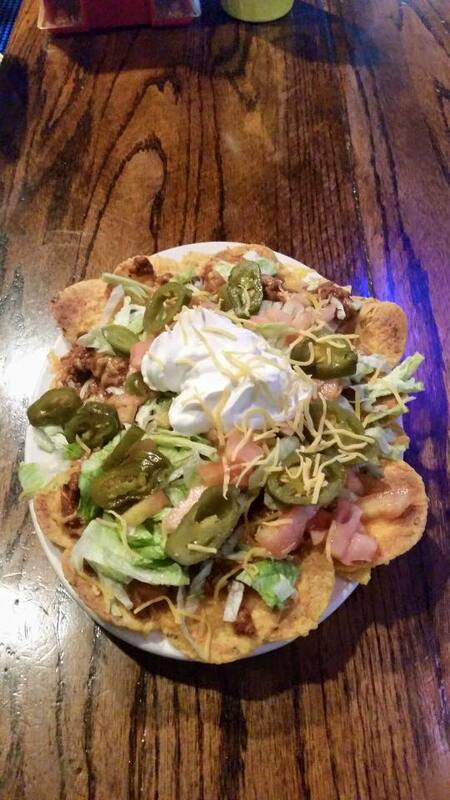 After all, we know good food when we see it. As always, the places and businesses about which I write in this space aren’t necessarily associated with the rally; they are some of my personal favorites and I want to share them with you. 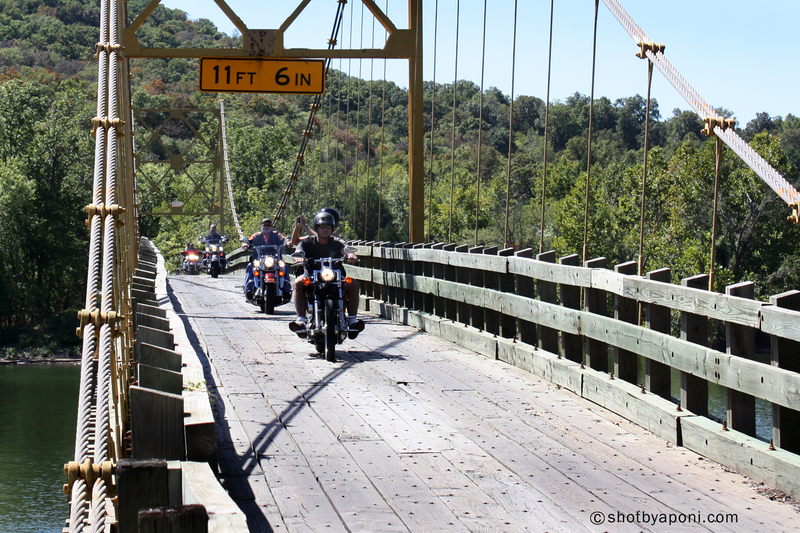 Are you bringing your ride to weigh in against the region's finest and most creative motorcycles? 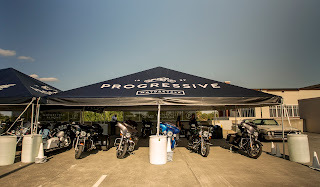 There is no need to pre-register, just bring your motorcycle the morning of the show between 8-9 am to register. 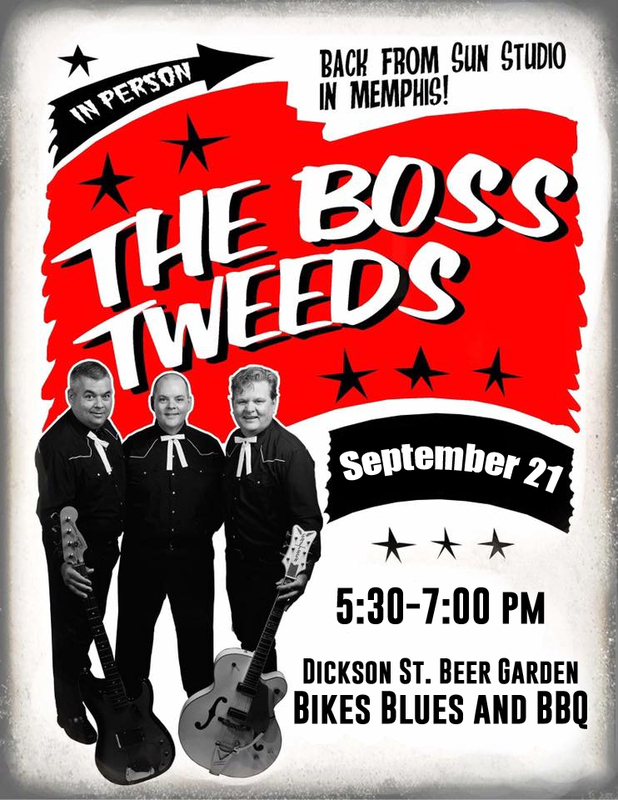 The show and battle take place in the Dickson Street Beer Garden during Bikes Blues and BBQ, located just across the street from the Walton Arts Center. Judging begins at 9am the with championship battle beginning at noon. The Battle of the Bikes is a people's choice championship where the top three motorcycles from each of the show categories go head to head and the winners being decided upon by crowd cheers, scientifically measured by the appropriate gadget! The crowd is great and the entire event is a ton of fun, with the very talented Laramie LaFarge of V8 Choppers as emcee. 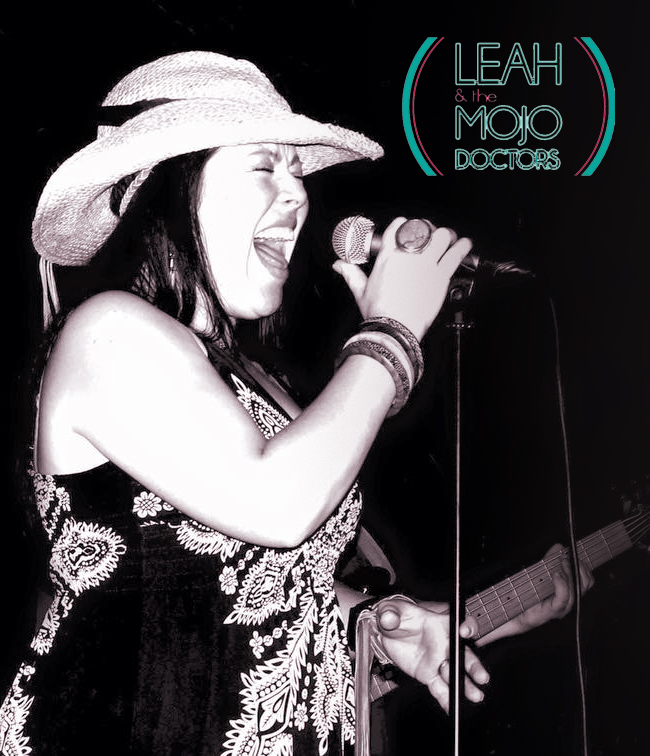 Join us for the fun! 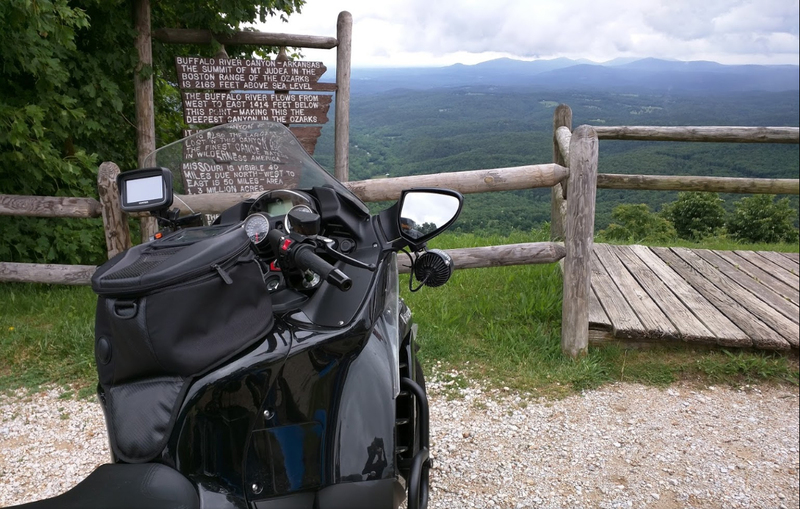 The ride itself is going to take you about 4 hours, of course you will want to allow for many stops as you'll be traversing past some of the states most incredible views and natural wonders. You'll head out HWY 412 going east, just before your turn at HWY 21 you'll come upon Kings River Country Store, a good place to grab some drinks, snacks or gas. They also have an outstanding kitchen, but you are going to have to weigh out your options here because you may want to wait for your meal until you reach Jasper. Once you reach the HWY 21 junction, you'll then head south along a piece of highway as pretty as you'll ever hope to see. 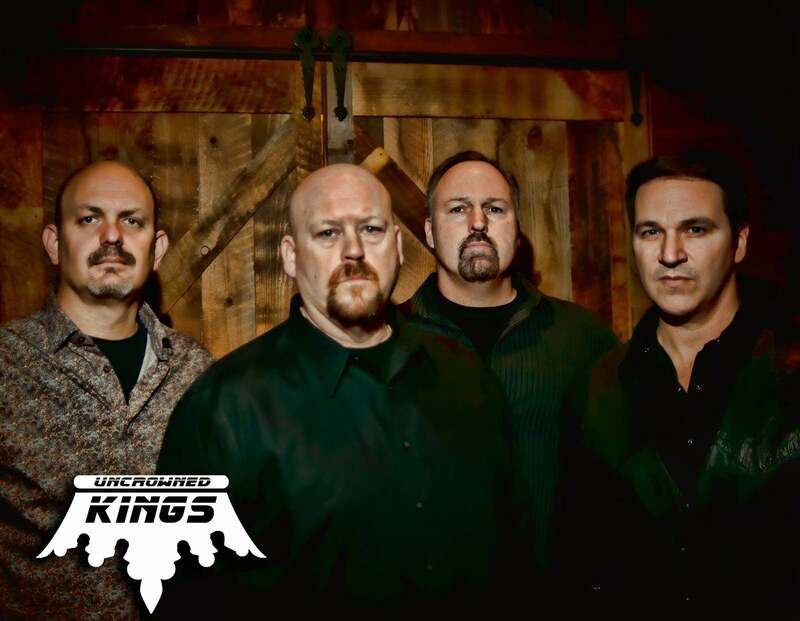 You'll meander through the quaint town of Kingston until you meet HWY 43, where you'll then want to head north. Once you get on 43, you're going to want to scan the fields along the bluff wall to the right for elk, as they are often seen along here. The earlier you can get here the better, as the elk are most frequently seen early in the morning, and again near dusk. To the left on this hwy, you will also come up on Boxley Valley where you can see the Villines cabin, built in 1850. There's a historic marker there with detailed information about the structure, if you're a history buff you'll enjoy the read. Continue along to the low water bridge just before Ponca, a perfect spot to pull over, kick off your boots and soak your dogs in the cool waters of the Buffalo River. 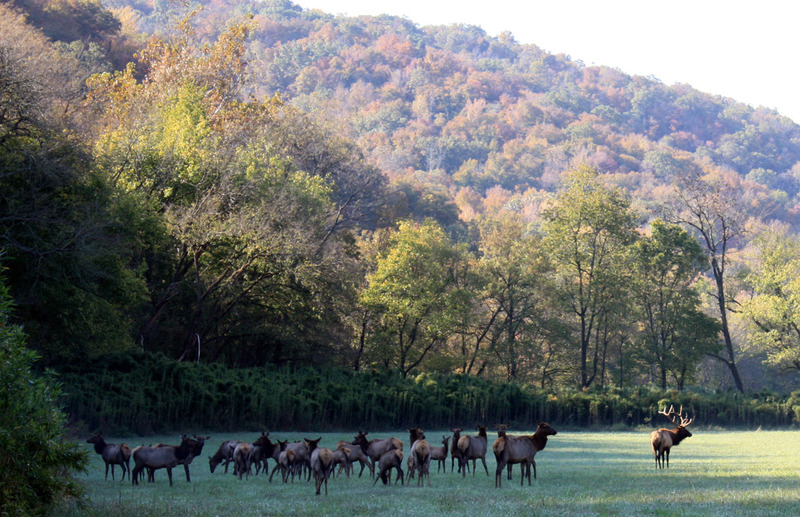 From there, if you decide to head on in to Ponca you will find the Buffalo Outdoor Center and Ponca Elk Education Center. Ease on back to HWY 74 and head east toward Jasper. The first part of this highway is quite incredible, you'll ride along sharp switchbacks, steep canyon drop offs on one side and tall rock bluffs on the other, not to mention the AMAZING views of the valley below. You'll pass Steele Creek Campground, which is a great place to picnic or even camp, but the trip down the mountain into camp is intensely steep while the road itself is gravel, so not really an ideal option for motorcycles. Drive on by to Jasper! 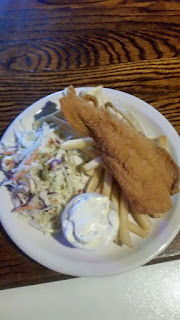 Once you reach Jasper, find the Ozark Cafe and enjoy a wonderful meal, just about everything they make is recommendable, and the service and atmosphere are great. Established in 1909, the cafe is listed in the National Register of Historic Places and is acclaimed as the second oldest restaurant in the state. 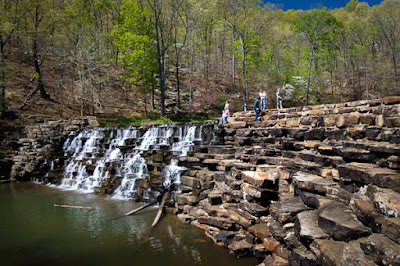 will have a great opportunity to stop at Scenic Point aka Arkansas Grand Canyon. You'll want a photo, it's compulsory. Your motorcycle, your sweetheart, your sweetheart and your motorcycle... it's just what we do when we are overwhelmed by such an inspiring view. Give in, do it. 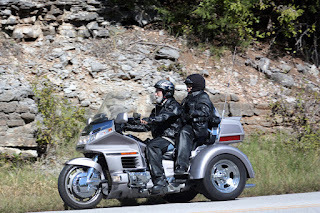 Back on the road, your'll continue south on HWY 7 into the Ozark National Forest. Basically, you'll follow this route all the way back to Dickson Street, which is essentially HWY 16 once you veer off HWY 7. 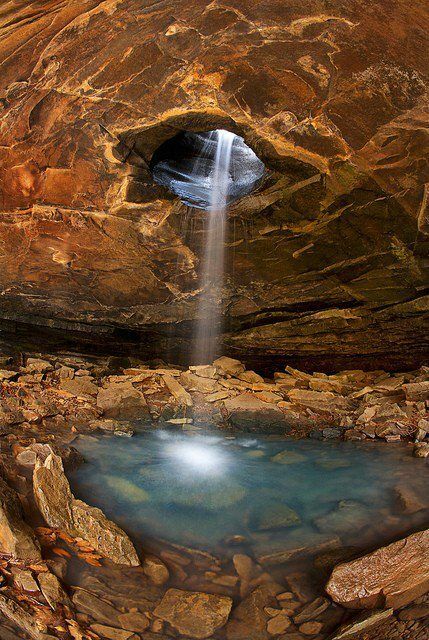 You'll be passing by Glory Hole Falls, and if you have the ambition and proper walking shoes to make the one mile hike from the trailhead to the falls, you'll have an opportunity to see this world famous spectacle of nature, a hot spot among photographers. As you continue along toward Fayetteville, you'll come upon yet another worthy stop. Terra Studios is just a few miles south of Elkins and is located just off the road. If you happen to enjoy incredible pottery and stone art, you'll love this as a stop-by. 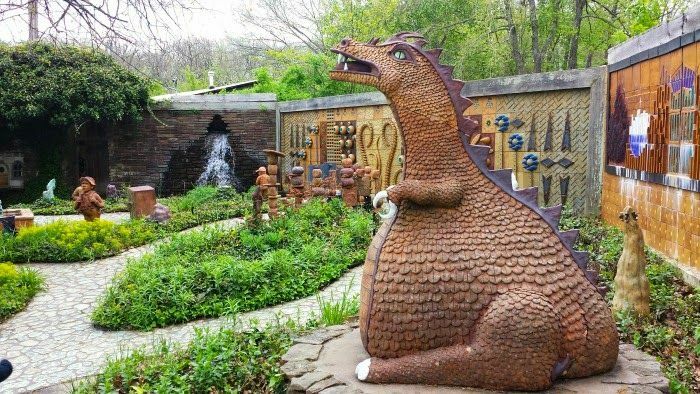 A quick tour of the grounds is quite enjoyable with the many whimsical statues, gnomes, trolls and other magical forest creatures displayed on the imaginative grounds of the studio. The tours are free. Most of my writing in this space has concentrated on ride routes, with the occasional detour into the realm of restaurants and bars. 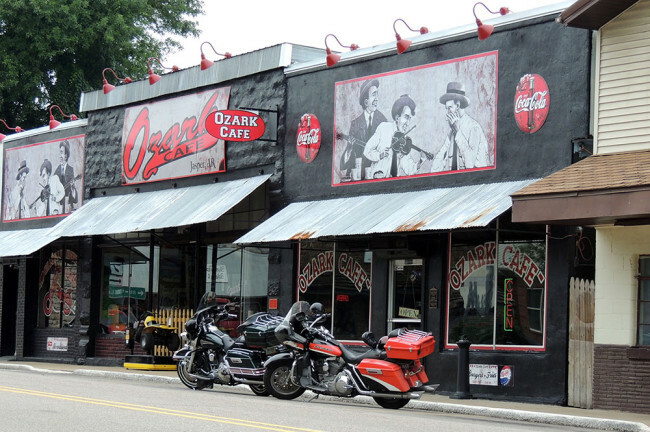 But the Ozarks region which is the home of Bikes Blues and BBQ® has a lot of unique and worthwhile attractions that are easy to miss. One of my favorites is the Daisy BB Gun Museum in historic downtown Rogers. I’m of the opinion that almost every gun enthusiast in American started with a Daisy of some sort. And while not all motorcyclists are “gun guys” or “gun girls”, lots of us are. I think the personality that likes the machine quality of a motorcycle appreciates the machine quality of a firearm. Or maybe we just like loud things. 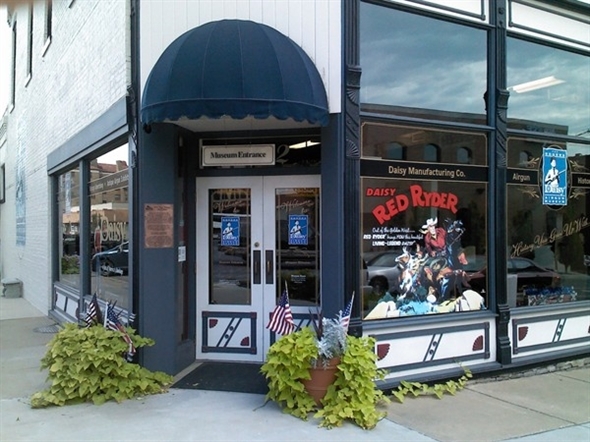 But whether you are a gun enthusiast or not, you’ll thoroughly enjoy a trip to the Daisy Museum. First and foremost, I’m pretty sure that this is the most complete collection of Daisy BB Guns in world. I believe every year of production is represented. Solid wood models, models that are primarily just steel frames, and of course, the venerable Red Ryder model. They even have a section devoted to “A Christmas Story”. If you’re like me, you’ll search the displays for your very first Daisy. You can wander through the museum on your own, or if you are lucky, one of the knowledgeable volunteers will give you the whole Daisy story. And the whole story is fascinating. Most folks aren’t aware of the Daisy partnership with the military during WWII. This is the place to learn about that and be astounded, as I was. And finally, there is a gift shop where you can pick up various Daisy products, commemorative and otherwise. The museum is supported primarily by donations and sales so a trip to the gift shop is doubly important. So, simply google “Daisy BB Gun Museum” for directions and info. 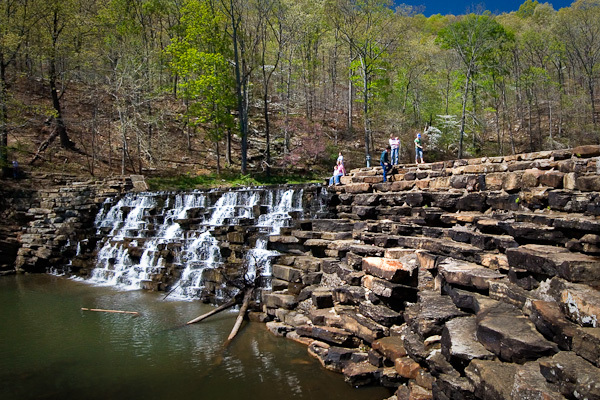 When you are visiting Northwest Arkansas, be sure to check it out. You’ll have a fine time, learn a little, and see a historic part of the area all at the same time. 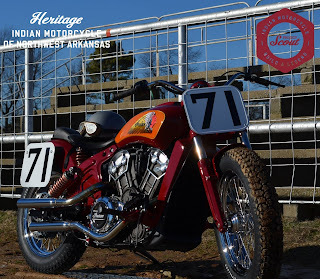 “Introducing Ol’ #71, a tribute to one of the greats, two time AMA National Champion & Indian Wrecking Crew racer, Bobby Hill. We built more than just a custom Scout, we rebuilt a legend! The inspiration for our Project Scout came from the winning tradition that Bobby Hill created in the late 1940’s through the 1950’s. 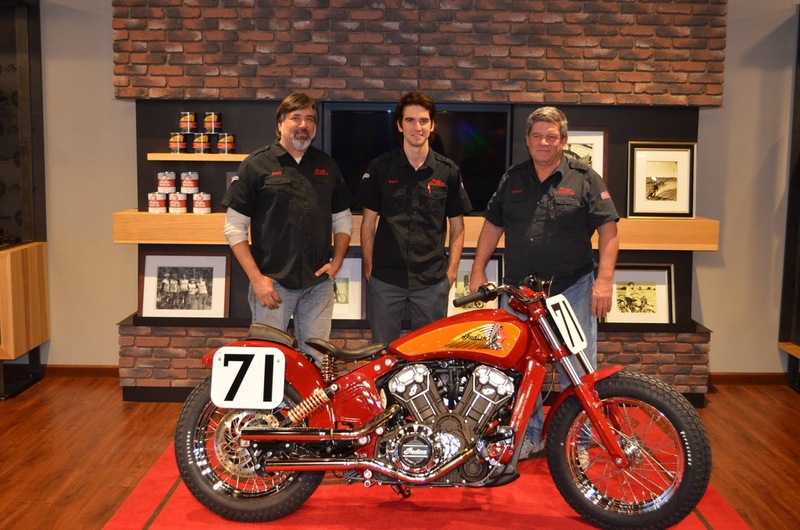 Not only is our custom Indian Scout reminiscent of Bobby’s bike with its two-tone paint scheme and colored headdress, we actually let Bobby himself put his own personal touch on this beauty. 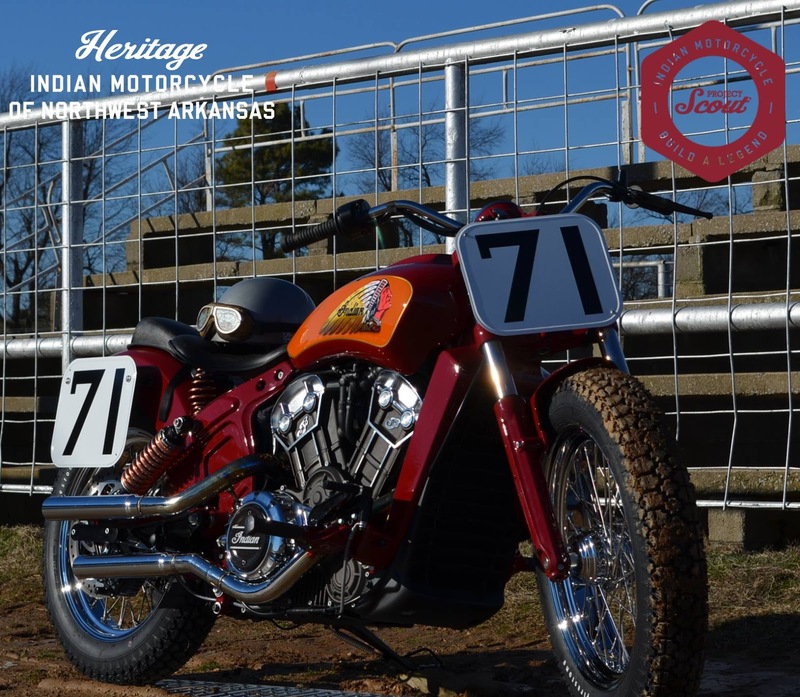 In mid-December, our IMRG Vice-President Jim Hiland and Heritage team member Johnathon Vandevort packaged the fuel tank and strapped it to the back of a 2015 Indian Chieftain and embarked on a 1600 mile journey to visit the legend himself. They endured temperatures in the teens and high winds but knowing that Bobby was going to put his signature on the fuel tank of our custom Scout gave them all the encouragement they needed. Once there, the Wrecking Crew legend shared racing stories, showed them his old racing jersey and other memorabilia. Part way through the visit Bobby stated…”Visiting with you guys reminds me of how much fun I had back then!” It was easy to see why Bobby was known as one of the friendliest racers of his era and was voted AMA’s most popular rider in 1951. Well Bobby, you’ve made this project not only fun but also more special than any custom Scout could be. 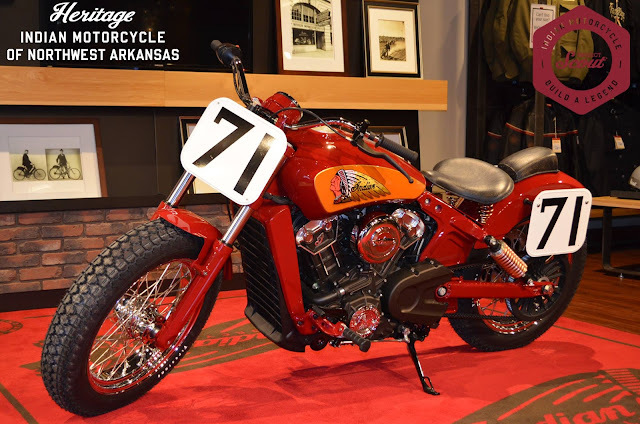 You’ll notice the sprung seat with copper springs and matching distressed leather fender pad, vintage style flat track handle bars and of course, number plates with the iconic #71. We didn’t stop there, Bobby shared a lot of details with us months ago that we incorporated into our build. Like how he ran 18” wheels and often ran on Firestone tires, which we added to our Scout. We painted the front end, frame and swing arm just to resemble his winning bike. Bobby insisted that we use the gold pinstripe on the fuel tank, just like he had! Our custom dual exhaust is staggered and offset, the rear shock springs are copper plated, our front and rear fenders underwent heavy fabrication and we even added the vintage left side air cleaner, all to bring back the look and aura of the two time AMA National Champion and famed Wrecking Crew racer #71. So, we ask our friends and fans to check out all the entries in this contest and cast your vote for the local guys, Heritage Indian of NWA. 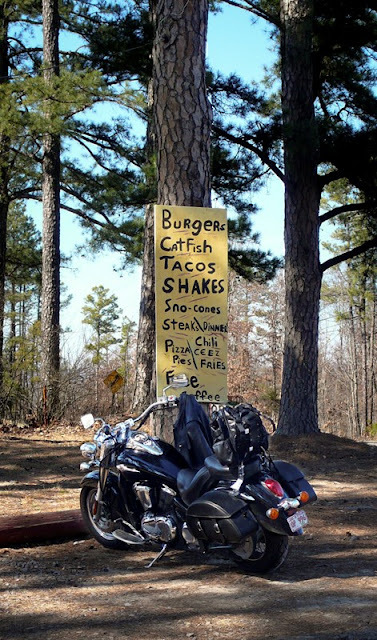 "Those that have been to Bikes Blues and BBQ before already know there are hundreds of miles of sweeping twists and picturesque views to eat up in the surrounding Ozarks. But while spending the day feeding the nomad within, one can also awaken a serious hunger from the carnivore that resides inside as well. 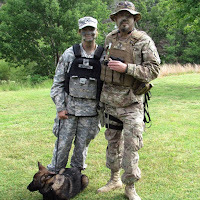 Many moons ago I found myself in such a predicament while traveling deep into the Ozark National Forest along AR-21. It was almost late afternoon and I was two gas stops in on my ride that day, but had neglected to put any fuel in my own tank. There were rolling hills of lush woodlands as far as the eye could see around me but unfortunately nothing that had a "cafe”,”restaurant”, or even “convenience store” sign attached it. I had become so famished that I could swear I heard growling even without engaging the throttle. And then about the point I started contemplating how tasty the fresh roadkill I passed a mile back looked, that's when I saw it! Turning a corner, it was revealed to me much like a mirage in the dessert. A small red barn outlined in yellow and peppered in trinkets including bowling pins and lit chandelier. Before my eyes could process what the heck they were looking at, I had passed it by and it was out of sight again. But luckily I caught a quick glimpse of the sign "Ozone Burger Barn". Surely my hunger is playing tricks on me I thought for a second, but I ventured back around to have a second look. As I pulled in and put the kickstand down I was relieved to find that I in fact had not had a hunger hallucination. However a part of me was questioning the sanity of a person who would open a burger stand in such a rural area. I walked up to the window and was bombarded with a surprisingly extensive menu of tasty options such as burgers, pizza, tacos & even fish. I was hungry enough to order one or five of everything but I thought I might start out with just a Mushroom Swiss Burger and a shake first. Standing there for a few minutes, I took in the tackily charming surroundings, including a water fall fountain with blue water, stuffed deer moose head wearing a fedora, and various outdoor toys and games. No signs of life yet from the barn made me begin to wonder if the place was actually open or not. Just then the small window opened up and a older man's upper torso (his face was out of view) asked in a commanding voice "What do you want?!" I recited my order, paid and gave him my name. Then in the same tone I heard "It'll be out in a minute," punctuated by a clack of the window closing. I winced a little at the man's lack of couth but my empty stomach was by far grumpier at that point. I took a seat at one of the adjacent covered picnic tables where I was greeted by a couple in matching Harley gear finishing up their meal. They told me they were from Russlleville (about 40 miles south east) And said that they come here quite often. The man added that he thought the burgers are the "best around!" This put me at ease a little after the cold reception I received from the man who was currently preparing mine. The woman smiled and gestured towards the barn. "Don't mind him, he's a actually teddy bear," she said. About 6-8 minutes later, the window opened again and my order was placed on the counter followed by "Matt!" and the clack of the window again. I wasted no time retrieving it and chowed down on the thick juicy hand made beef patty, fluffy football shaped bun and generous portion of fresh steak fries. Only pausing to make a couple of trips to grab more napkins to clean up the tangy sauce and savory mushrooms that didn't quite make it to their final destination (the sign out front wasn't kidding when it boasted "3 napkin burgers"). 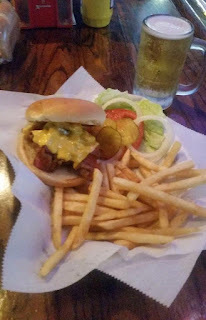 Needless to say it was one of the best burgers I've had in a long time! And a most memorable dinning experience. And NO I am not just saying that because I was hungry enough to eat a horse that ate a smaller horse. I have been back several times since and have never been disappointed…err…by the food. The service on the other hand is sometimes lacking if not a little ornery if you ask a lot of questions or get too picky with your order. 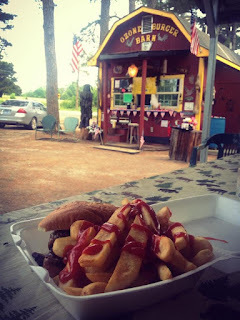 But personally I have come to find that the owner's grumpy disposition (real or played up) is just as much a part of the Burger Barn's charm as it's kitschy decoration, towering pines and messy burgers. 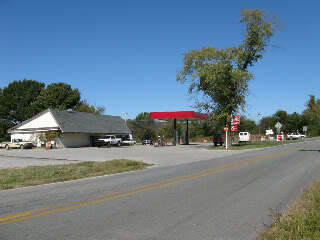 The Ozone Burger Barn is tucked away in Ozone, Arkansas just off the 21 byway, (15 miles north of Clarksville). If you have an appetite for great food in the great outdoors that is served with lots of character and a little sass, then you owe it to your self to check out this truly unique carnivore's oasis in the Ozarks." December 17th 2013 was a day that would change my life forever… It was the day I met the love of my life. Chad Neal showed up for our first date with yellow roses and kissed me right after saying hello. I knew he was different from that moment. That was the moment I fell in love with him and we haven’t been apart since. It’s not easy to find someone who thinks like you and loves everything you do. But when you do, you hold on to them and cherish every moment together. Since I’ve met him, he has shown me a whole new world of adventure! He had two passions when I met him… His jeep and his bike! I personally had never experienced either before. The first time he put me on the back of his Dyna Wide Glide, I was very nervous. But after the first five minutes, I was in love! The freeing feeling of being on a bike, with the warm sun on my face was amazing! I was hooked! 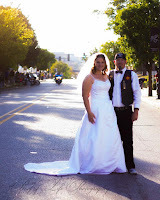 He took me to my first BBBBQ last year on the Dyna. It was awesome! I loved it as much as he did. Unfortunately the small passenger pad on the back was excruciatingly painful to me, so on our second day of the rally he traded it in for our Heritage Softail Classic. Now we can ride all day long, take trips all over and we both can enjoy the ride! Chad and I are very patriotic and we love our country. Chad is an Iraq veteran and left that country with a broken back. But he doesn’t let that hold him back, a trait I admire the most. Another great trait is his ability to not just dream, but make those dreams a reality. In December of 2014 we fulfilled a dream of ours when we opened our store Save Yourself Survival and Tactical Gear and Gun Range in our hometown of Oktaha, OK. Chad proposed on our grand opening day as I was cutting the ribbon. Saying I was happy could not even begin to describe me that day! After the excitement and things had settled down, I asked him what kind of a wedding he wanted. We both have been married before, and like most weddings his were planned by the bride. I wanted our wedding to not be just what I wanted, but what he wanted as well. We threw around a lot of ideas, but nothing really seemed right. Months went by and we still had no idea what we wanted. It was the perfect idea and he already had it all arranged and us scheduled for September 25th at 4:15pm on center stage when he told me his idea. He knew I would love the idea before he ever said anything. Over the next several months we planned the event. 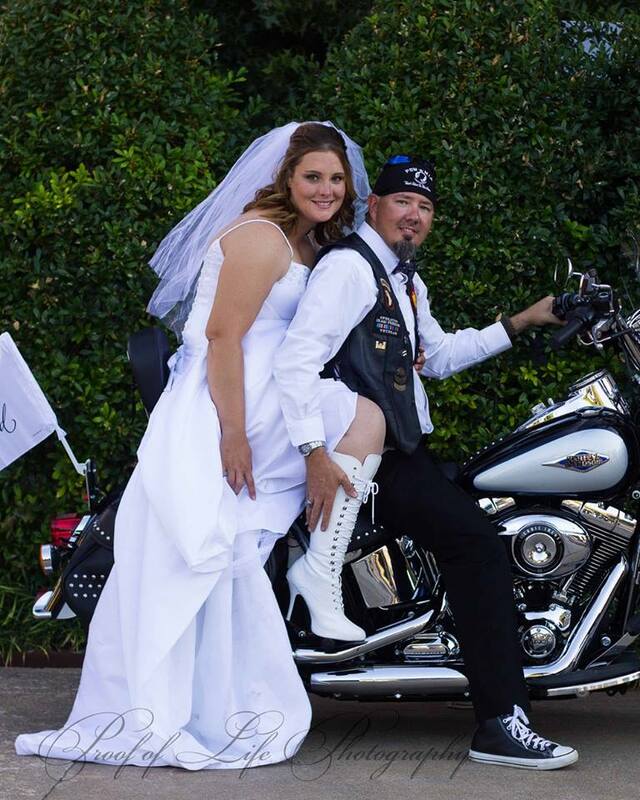 I was given a beautiful wedding gown by a dear friend, so we went with “biker formal” attire. I even bought white high heeled leather boots to wear! The day of our wedding arrived and I loaded all five of our children up in our friends van and Chad rode the bike. We left in plenty of time however we never expected an accident on the highway. So we were running late when we parked the van behind the Baptist church at the corner of Dickson St. and College Ave. So with five children trailing behind me, I took off running down Dickson Street, trying to make it to our wedding on time. I was instantly regretting those high heeled boots! We eventually made it, just ten minutes late, and completely out of breath. But when I saw Chad standing there waiting on me in front of the stage, I knew it was all worth it. And while we were on the stage saying our vows, I knew that this was the best wedding ever. As we rode up and down Dickson Street on the bike after, with everyone clapping and cheering, I knew I was where I belonged… behind the man that I loved… on the back of his bike! If you weren’t there last year for the 3rd Annual BBB Car Show, you don’t know what you missed. We had it all, customs, street rods, vintage treasures, rat rods, even custom bicycles for the kids! 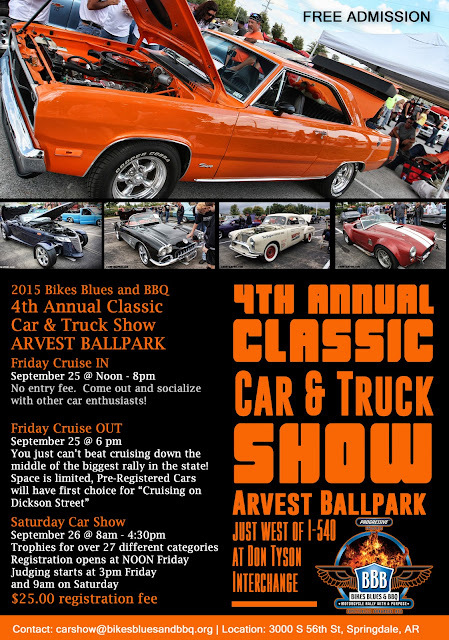 All that and vendors, a DJ, special awards, everything that goes with a great car show. This was a GREAT car show, at a motorcycle rally! This year we’ve expanded – more cars and more attractions – all at the same great location. The BBB Car Show will be held on Saturday, September 26 at Arvest Ball Park in Springdale. The address for Arvest Ballpark is, 3000 South 56th Street, Springdale, AR 72762. The Park is essentially at the intersection of Hwy 412 and I-49, with easy access and lots of parking. But, it’s not only a static car show. 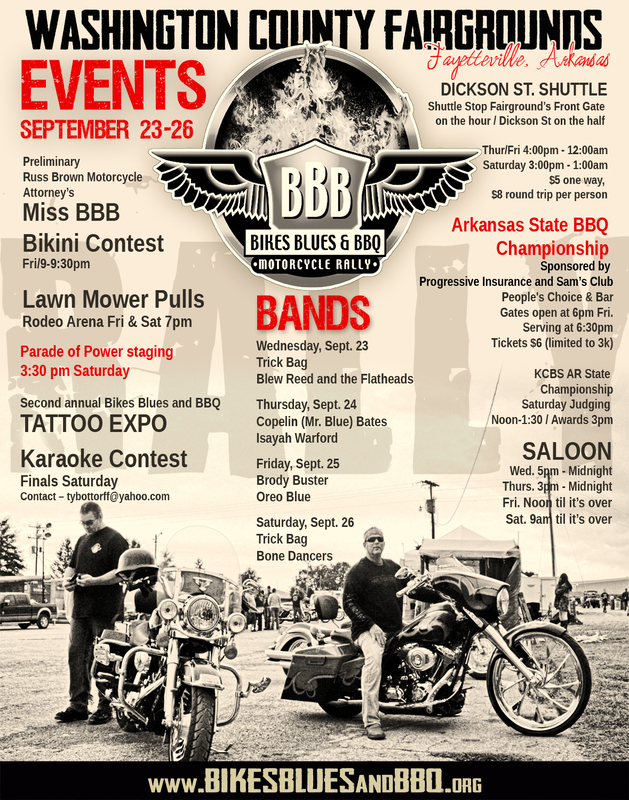 On Friday afternoon, pre-registered vehicles will get to participate in the Bikes Blues and BBQ Dickson Street Cruise, a car parade through the heart of the rally. It’s a great event that EVERYONE can enjoy! Joe and Courtney Sweeney-Legore were from the same hometown and graduated from the same high school. It wasn’t until nearly 17 years later that they met again and started dating. Joe had always been an avid motorcycle fan, but no longer owned a bike while they were dating. 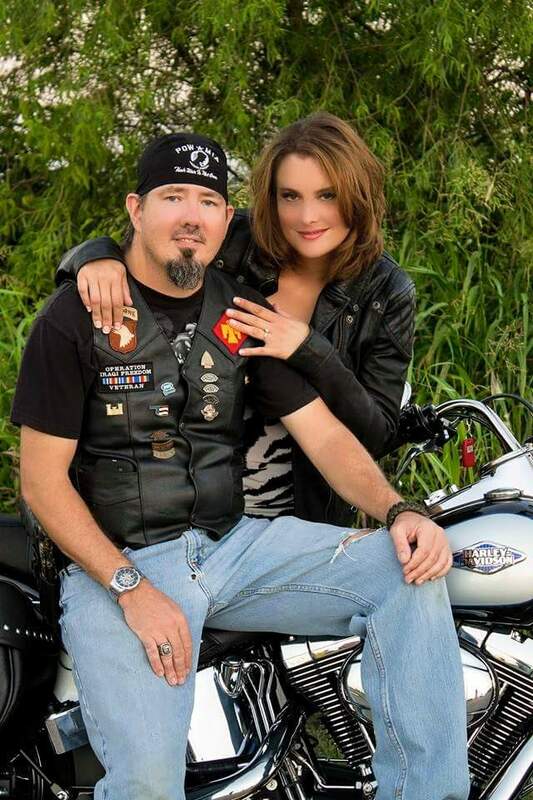 Courtney made him a promise that, one day, she would buy him a Harley. Three years after they were married, she did! For their fourth anniversary, the couple made their first trip to Bikes Blues and BBQ, had an incredible time, and upgraded their bike to the Road King they call “Casper”. 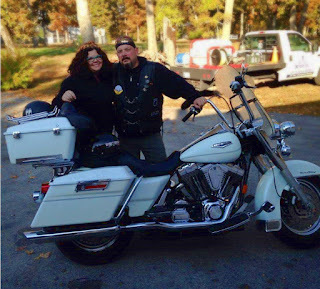 They have enjoyed many rides, weekends, poker runs, and rallies together, but Bikes Blues and BBQ is the one Joe and Courtney have looked forward to returning to. They will be renewing their wedding vows on Saturday at 6:30 p.m. main stage in the Beer Garden on Dickson Street. Please join us as we celebrate with Joe and Courtney! Get ready for a beautiful ride and a chance to win big! 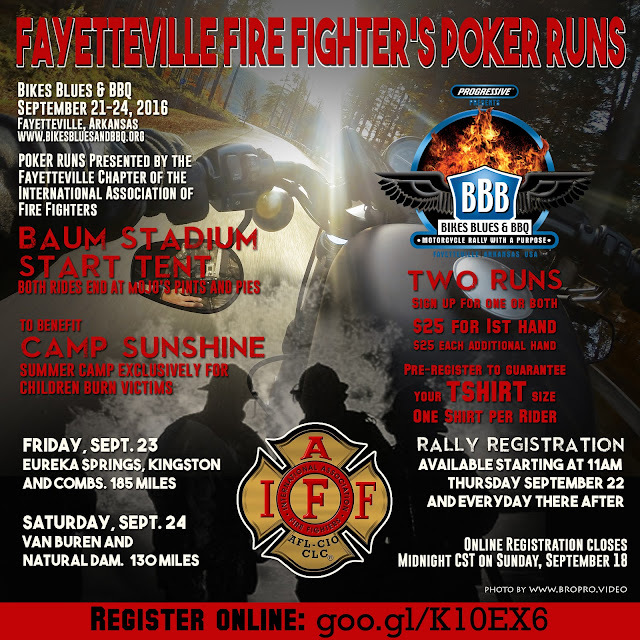 Every year, the Fayetteville chapter of The International Association of Fire Fighters presents not one, but two superb Poker Runs! You don’t have to be a firefighter to enjoy these runs! On-site registration is available during the rally at the Fire Fighters booth, located at the Bank of Fayetteville “Train Bank” at the Northwest corner of Dickson St and West Ave, or you can pre-register on-line by clicking here. For those of you who have not had the pleasure, the IAFF Local 2866 offers runs through some of the most beautiful roads you’ll ever see. 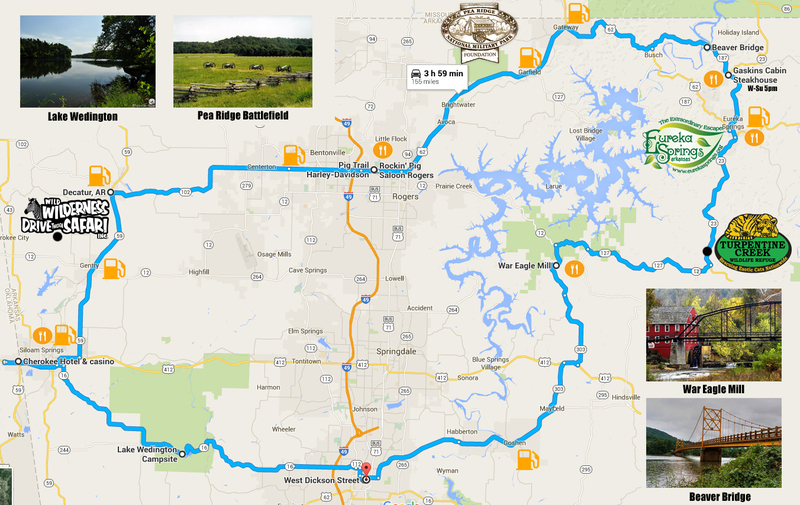 If you are unfamiliar with the Northwest Arkansas area, but want to experience the great riding and scenery that the area has to offer, this is your perfect opportunity! The money generated by these runs benefits Camp Sunshine. Camp Sunshine is a summer camp facility for children who are burn victims; a place where they are like everyone else and can simply have a good time, make friends, and enjoy all the things that other children enjoy without bearing the stigma of looking different. To visit Camp Sunshine is to come away teary-eyed, but with such appreciation of the bravery of these children and a profound respect for the firefighters who work so hard to provide them with this opportunity. We sincerely salute I.A.F.F. and every other organization that supports this noble endeavor. 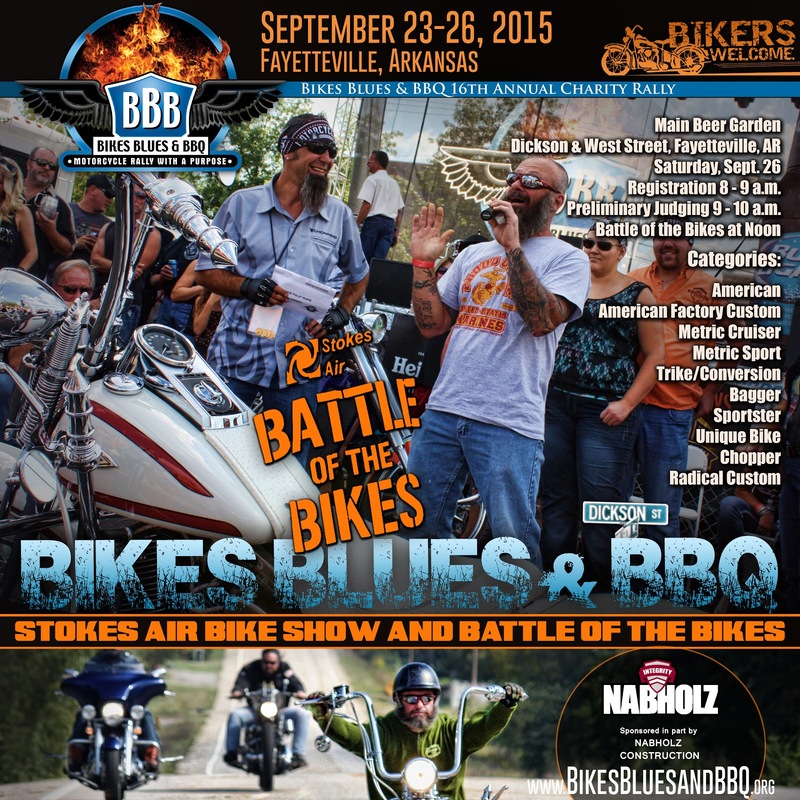 On both runs, last bike out 10:00 a.m., last stop closes at 5:00 p.m.
Pre-Registration forms must be submitted no later than midnight CST Friday September 18, 2015. Pre-Registration will be closed at that time. Only pre-registered riders are guaranteed the t-shirt size of their choice. The OVMA and Bikes Blues & BBQ Inc. 2nd annual vintage motorcycle show! THE SHOW OPENS TO THE PUBLIC AT 9:OOAM SATURDAY THE 26TH. 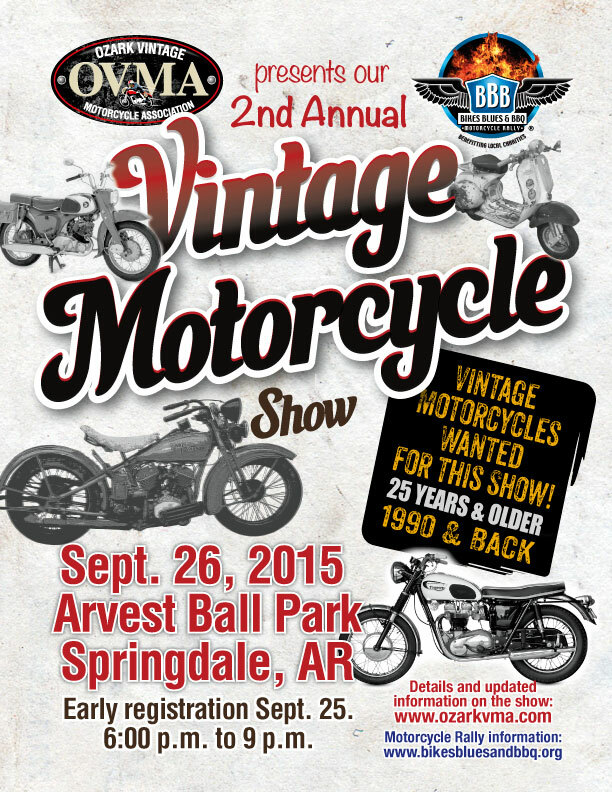 Please join us for our second annual vintage bike show being held on Saturday September 26, 2015- rain or shine- at the Arvest ballpark in Springdale Arkansas. This is an open invitation to all to bring your vintage bike(s) and show them off. 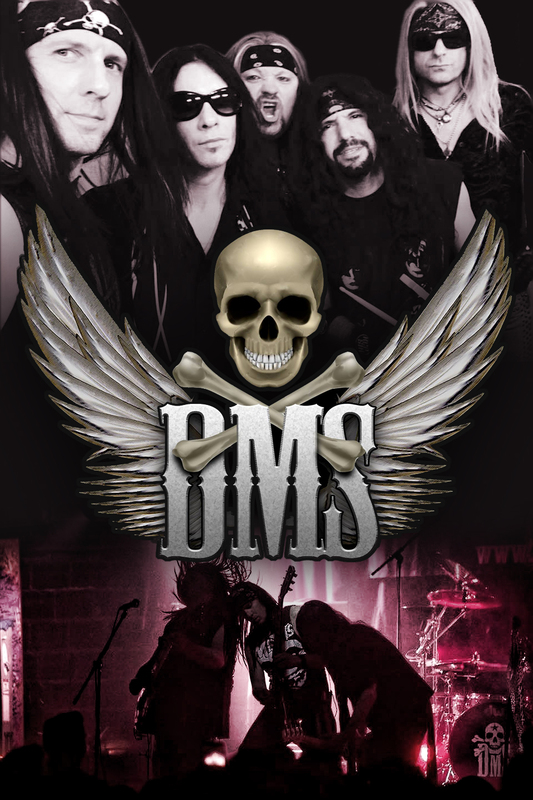 The show will take place under 6400 square feet of tent in a paved parking lot. Your bike(s) will not be out in the elements, and neither will you. Improved concessions are available on site. Your trucks and trailers can be parked on the lot close by, and there will be uniformed security beginning on Friday and going through Saturday. We will have early registration available on Friday evening from 6pm until around 9pm. Don't have a vintage bike to show? Then come on out and attend the show anyway! You don't have to own a bike to look. And it's free! Bring your mom and dad out, they will love all the old motorcycles. They may have owned and ridden some like them. The Show is being held during the Bikes, Blues and BBQ rally that runs from September 23 until September 26 of this year. The rally usually brings in 400-450,000 bikers, and some projections are pointing to 500,000 this year. Pair that with our MSA of more than 500,000, and your bike(s) are going to be seen by a lot of people. 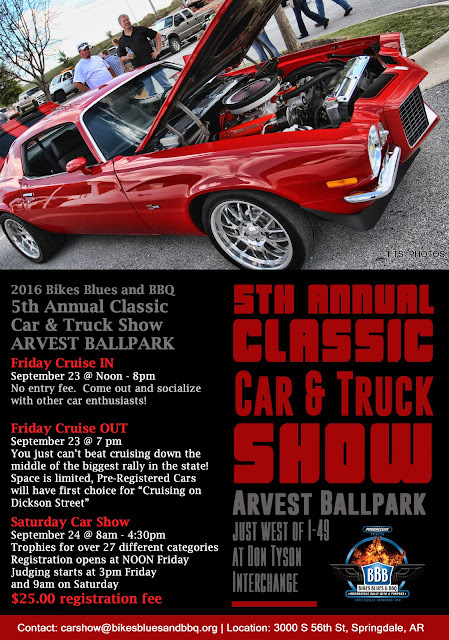 There will also be a big car show, Wounded Warrior project, live music and a fireworks show at the Arvest venue. So, bring some bikes to show and one to ride. Spend a Couple of days if you can. Northwest Arkansas has some of the best riding in the country, and there is more to do during this event than you can possibly get around to. The show will include 1st and 2nd place awards in the Rider category and the Restored category. The usual classes of American, British, European and Pacific Rim will apply to each category. There will be 1st,2nd,3rd and 4th place awards in the Survivor category. In the Custom category, there will be 1st and 2nd place awards for the classes of Bobber, Chopper, Cafe and Rat. 1st and 2nd place awards for the Tiddler(100cc and less)class, in addition to 1st, 2nd 3rd and 4th place awards for Competition bikes. There will also be Best of Show, Sponsors Choice(4), and Directors Choice awards given. We believe that involvement from other clubs is crucial to the success of the show, and would like to include individuals from different clubs in the judging process to help promote fairness to all who enter. If any of your members would consider helping judge, we would love to hear from them. Contact Jim at parksidemo@sbcglobal.net with any questions. The individual entry fee is 10.00 for your first bike and 5.00 for each additional bike. Your 5th and subsequent bikes are free. Individuals and clubs presenting 8 or more bikes will have all registration fees waived. SPECIAL: This year there will be no entry fee for bikes 45 years and older! Registration 6-9pm Friday and 8-10:30am Saturday. Judging 11:00-2:00am, awards ceremony at 2:30pm. show ends at conclusion of awards ceremony. An antique for purposes of this show is any motorcycle from 1990 back. (25 years or older). The Best BBQ the South Has to Offer! 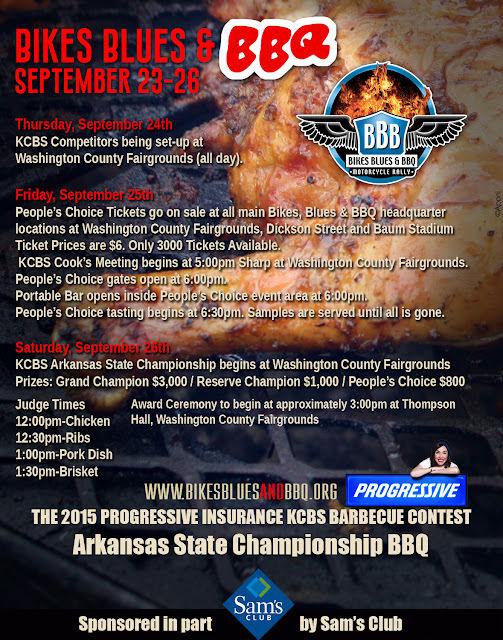 If you want to know what barbeque is all about, the People’s Choice Competition portion of the Progressive Insurance Arkansas State BBQ Championship Friday night at the BBB Official Campground is where you need to be! For a $6 donation, you get to not only taste, but cast your vote for your favorite “cue”. Sample some World Class BBQ, wash it down with a tasty beverage, and enjoy some of the most unique attractions the rally has to offer! This is some of the best BBQ in the South! We open the gates for People’s Choice at 6:00 p.m. and start serving at 6:30 p.m. Come early and eat a lot. And while the People’s Choice is fun for all, the Kansas City Barbeque Society sanctioned portion of the Progressive Insurance Arkansas State BBQ Championship is the BBQ Battle Royale. Contestants put their best meat forward for a chance to win thousands in prize moneys. 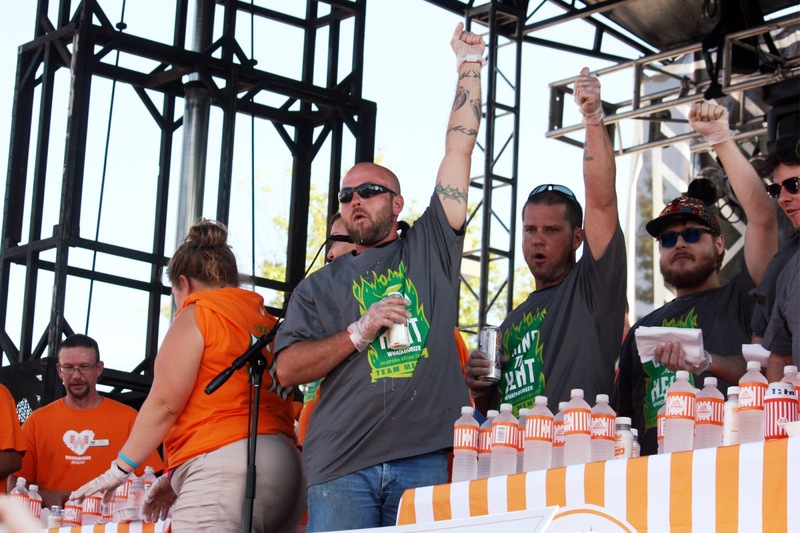 So if you think your BBQ is the best in the land, here’s your chance to prove it. The Fairgrounds is home to a party in itself. Of course, it’s the official campsite of the rally, but it’s so much more. For instance, the Arkansas State BBQ Championship sponsored by Progressive Insurance and Sam’s Club (the official supplier to Bikes Blues and BBQ), lawn mower pulls, free live music in the Blues Alley Saloon, the preliminary round of the Russ Brown Motorcycle Attorneys’ Miss BBB Contest, and the second annual Bikes Blues and BBQ Tattoo Expo. 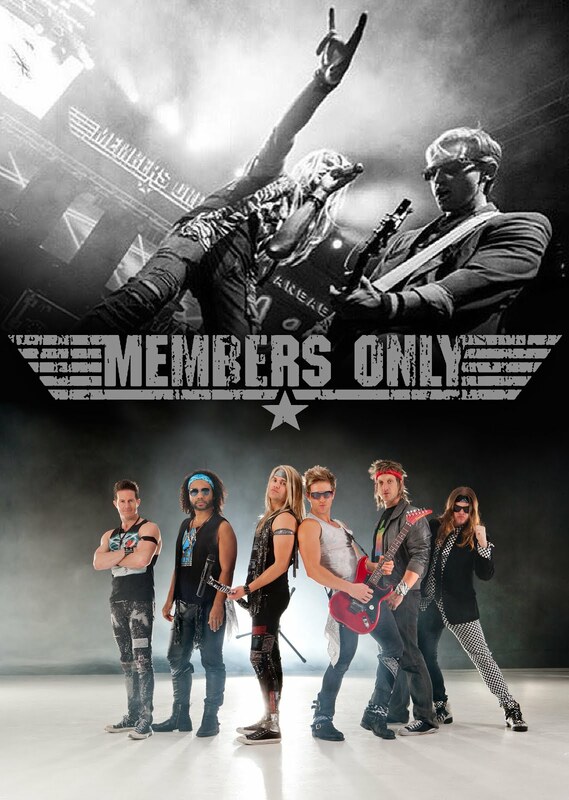 Two of our favorite sponsors are combining to put on a great VIP ride this year. We got so much positive feedback last year about the ride, we decided to do it again and even improve it. So, check this out: An extended ride through the beautiful hills of western Arkansas and eastern Oklahoma, a full lunch at Cherokee Casino in West Siloam Springs plus free play cards, experienced ride captains to show the way, and of course, the commemorative 2015 bottle of Jack Daniels Single Barrel. And that’s not to mention the gifts from Jack Daniels and Cherokee Casino. One of the comments we got last year was that the ride legs weren’t long enough, so we’ve remedied that. You’re going to ride a lot, through some beautiful country. All this for $100 per bike and rider, and $50 per passenger. Spots for the ride are limited, so sign up early while there are still openings. If you haven’t experienced it yet, here’s your last chance. 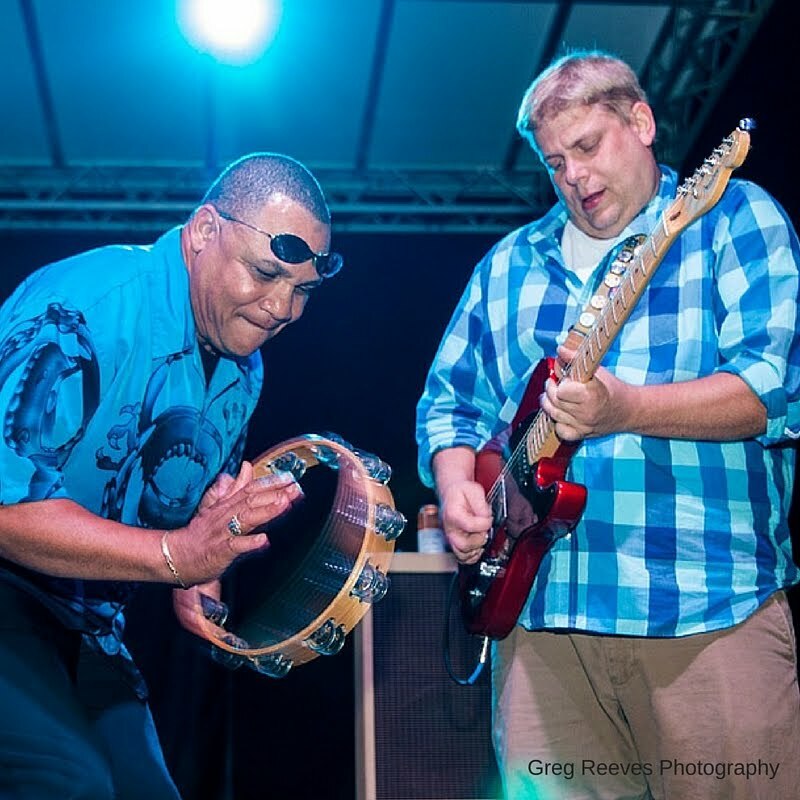 Flo’s Chop Shop is coming to Bikes, Blues and BBQ! We’ve been on the road all summer long, and at our fifth and final rally stop, we’ll be setting up Flo’s Chop Shop so you can enjoy a free beard or mustache trim or shave, boot shine or even a manicure! And if you’re a customer, let us know—we have a VIP gift waiting for you. Plus, when you arrive, you can take advantage of our free, secured and covered 24-hour parking behind Hog Haus Brewing (but hurry as spaces fill up quickly). 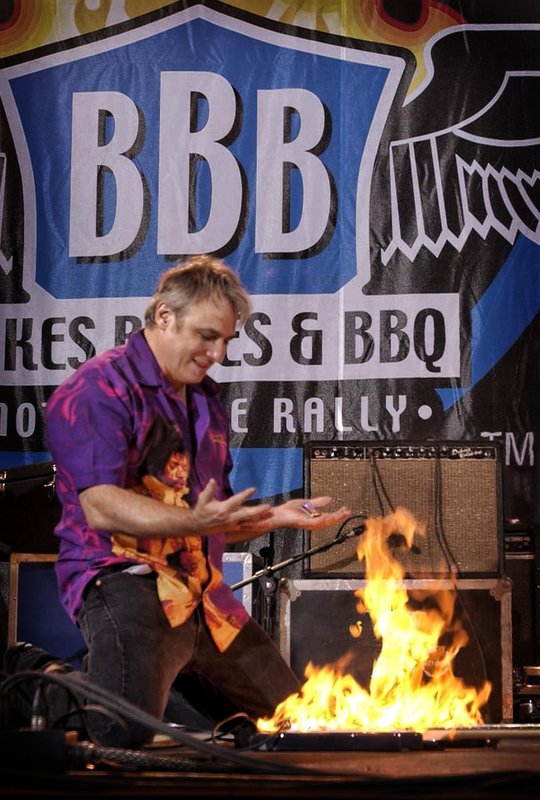 Of course, there’s so much more to Bikes, Blues and BBQ than, well, bikes, blues and BBQ. Since its inception, rally leaders and attendees have raised and donated over $600,000 to local charities making it the nation’s largest charitable motorcycle rally. With that in mind, we want to contribute to the effort, too. So this year we’re partnering with Habitat for Humanity to host a free Flo-waffle breakfast on Saturday September 26th from 8:00 to 10:00 a.m. at the Bikes, Blues and BBQ Beer Garden on Dickson Street. No donations necessary—breakfast is on us. But if we fill you up right, consider a tip—any extra donations will benefit Habitat for Humanity, too. Hundreds of thousands of people attend Bikes, Blues & BBQ with some of the most awesome bikes around. Everything from tricked out custom choppers to rockin’ Harley’s and sweet metric bikes crowd the streets of Northwest Arkansas. There’s something for every taste, cruisers, vintage, sportbikes, and dressers. What better way to showcase these amazing rides than to round up the best-of-the-best and let the public decide which one is the coolest of them all? And that’s what we do every year. The Stokes Air Battle of the Bikes is a drive in bike show with winners named in a variety of categories. 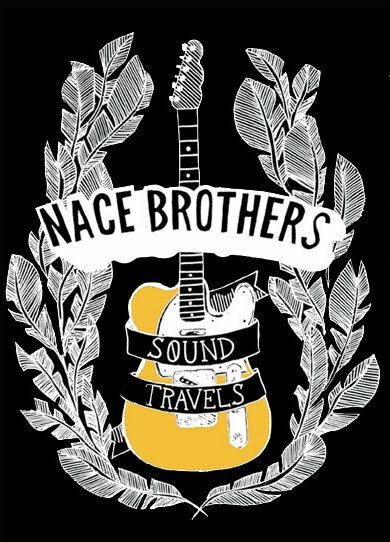 We stage this competition on Saturday morning/afternoon in the Bikes Blues and BBQ Beer Garden on Dickson St. So bring your “baby” down and see how it stacks up, or just come by and check out some of the best looking bikes in the world! After the initial Bike Show, we select the top three entrants from each group and conduct a “people’s choice” competition called “The Battle of the Bikes.” Bikes of various types go head to head with audience reaction determining the winner. The winners prize? An enormous championship belt. In the poster: Emcee Laramie LaFarge and Matt Gillen. Photography by Aponi. 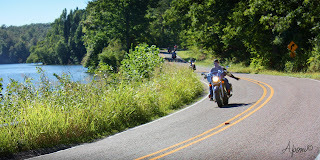 Every year, thousands of riders come to Northwest Arkansas looking for the best that the Ozarks have to offer. One of the best ways to find the good rides, as well as the cool places is to check out the official rally guide. BUT, the locals (in this case, me) have their favorites that often are easy to miss. Heck, we’ve got hundreds of miles of great roads, dozens of great restaurants and bars, and a ton of just cool places to see. So, these are some of the roads and places that I really like. Some of these are associated with the rally in one way or another, but that’s not why they were chosen. They are on the list because they are some of my favorites. If you are coming in from the south, try out Hwy 10 in Oklahoma. The section I love runs from Tahlequah north to “Little Kansas”. It tracks parallel with the Illinois River through a 25 mile route featuring both river views and overhanging bluffs. On the northern end of the road, just south of “Little Kansas” you’ll round a curve and see the gravel parking lot of a locally legendary bar, Buffalo’s Mule Barn. Walk inside and you are in the sort of place that the American Pickers would find irresistible. To say Buffalo is one of the most interesting bar owners in the world would be a ridiculous understatement. But be warned; don’t offer to pet her Coatimundi. The beast is a little particular concerning who touches it. When you leave the Mule Barn, head back south to Skelley School Road (Chewy). The first half of Skelley School Road is like riding through a tree lined cave. And then, there’s the bridge. You’ll recognize it immediately. You can park by the entrance or take the gravel road down under the bridge. It makes a very good stop. 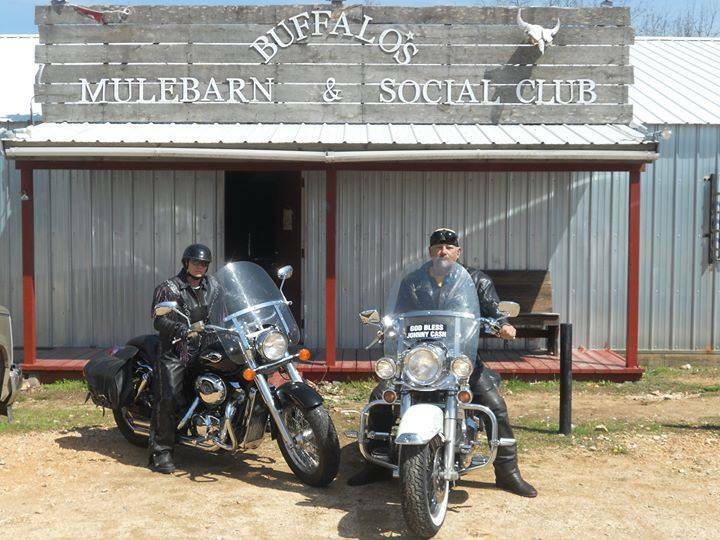 Leave there and ride east until you “T” into OK Hwy 59. After that, going south takes you to Westville and Hwy 62 to Fayetteville, or going north takes you to Siloam Springs and Hwy 412 to Springdale. Another favorite ride? Sure. From the Baum Stadium venue, just go south on Razorback Road and stay on it (it becomes AR 265). When you get to the bustling metropolis of Hogeye, the road comes to a T. Turn right and go a couple hundred feet and then left at the “famous Hogeye Mall” which bears a striking resemblance to a weathered convenience store. U.S. 71, a great ride in itself. North to Fayetteville, or south to Alma. Your choice. Finally, for the best rides in the area, I heartily recommend you pick up a copy of the BBB Official Rally Guide or purchase a Butler Map of the Ozarks. The rally guide (free, by the way) contains various suggested routes, hints about local attractions, and a lot of information you’ll find extremely valuable. The Butler map is a color-coded waterproof tool outlining roads based on riding quality. Check out blog again in a week or so. I’m going to take you to the Dead Pecker Inn just because I love the name, and then to K.J.’s Caribe Restaurant for some of the most amazing food you’ll ever have.